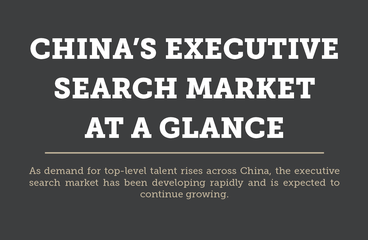 China's executive search industry has been developing rapidly over the years and is expected to continue growing. What are the driving factors of the increasing demand for management and C-level executives in the country? As China continually proves itself as one of the world’s superpowers with a supersized economy to match, it has found that it needs more and more senior executives in order to keep up with all the demand for growing firms and businesses. When a business grows, it must inevitably hire more employees, including those at senior and C-suite levels. When it comes to hiring these top-level executives, it is important that companies hire candidates who possess the skills, qualifications, and experience they are looking for, as hiring subpar senior leaders may undermine their growth down the road. In the introduction part we have explained why executive search firms exist, and they appear to be fast-growing in China. Executive search firms are organizations which search for top-level managers and executives, often being informally called “headhunters”. These teams use special tactics to attract potential talent, often contacting top-level executives who currently work for other competitor companies. Based on a recent article published by Xinhua News Agency, China currently has around 50,000 executive search firms in the country, with around 300,000 to 400,000 full-time “headhunters” who work for these firms. The growth rates of these firms are exceptionally large, with double-digit growth rates being observed. The executive search market is currently forecasted to grow at a rate of around 20% per year, expanding its value and size. The market is currently worth around 50 billion RMB, and is set to reach 100 billion RMB by the year 2020. The interesting thing about the rise of executive search firms is that they inevitably reflect the rise of top-level businesses in China, who possess a symbiotic relationship with them. Chinese executive search firms are typically concentrated in Tier-1 cities such as Beijing, Shanghai, and Guangzhou. However, this is beginning to change, with more and more firms penetrating markets in Tier-2 and Tier-3 cities too, thanks in part to policy changes and government support, as well as a desire for cheaper commercial real estate. Cities such as Chengdu, Suzhou, and Hangzhou are becoming increasingly prominent cities for executive search firms, expanding China’s technological hubs as a result. The Chinese market is growing more mature as time goes on, and it appears that the demand for executive talent in these cities is not going to diminish any time soon. Management localization continues to be a trend for international corporations in much of China, something which is inevitably giving way to an increased presence of executive search firms with a strong footprint in the Chinese market. While it used to be the case that many multinational businesses employed top-level executives from abroad, an increasing amount of foreign-invested companies in China are looking to replace their expatriate executives with local Chinese-born executives, increasing the demand for native Chinese talent in these organizations. This strategy of management localization in China helps multinational companies to build trust and shows long-term commitment in the country, while employing local senior management staff ensures that they have sound knowledge of the local market and any emerging trends. Employing local talent also reduces the burden on an enterprise’s HR department and saves time and money in the long run. We previously discussed the phenomenon of management localization in this article, which refers to a panel discussion on the topic by the European Chamber of Commerce in China. Chinese firms are finally catching up with their international competitors, and are making their names known on the world stage. As the world’s second-largest economy, it’s no surprise that China is seeking more autonomy and professional business acumen when it comes to running their enterprises. Executive search firms used to be primarily used by multinational corporations to find top-level talent; however, local Chinese firms are now more competitive and are beginning to recognize the innate value of a decent executive search firm. As an increasing number of Chinese firms recognize the importance and value of executive search firms and what they can offer, the demand for professional headhunters is beginning to skyrocket. If you want to read more about how Chinese companies are upping the competition for executive talent please find more background information in this blog post. Although China used to be known as a primarily production-oriented economy which was known for producing goods and products, it is increasingly looking to adopt a more Western-oriented economic model which is based on services rather than goods. As China begins to compete with countries such as The UK and The US and their service-oriented economies, it needs to hire more top-level and C-suite executives who can seamlessly facilitate these changes over time. All of this means that there is a high amount of competition for top executives in China, which means that Chinese businesses require executive search firms in order to “thin the herd” and assist them with their extensive hiring process. Specialized executive recruiters are skilled at attracting top-level talent to companies, something which should be even easier for local firms as Chinese companies are able to offer more attractive compensation packages to their potential employees, pulling them away from competitor companies and growing their own in the process.